Observation - Duck - UK and Ireland. Description: Struggling with this one, not sure what kind of duck it is. Black and white markings with some brown, medium to large sized duck, broadish beak. Struggling with this one, not sure what kind of duck it is. 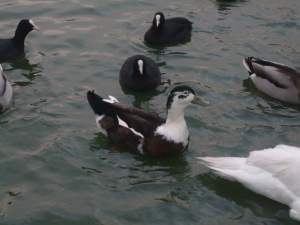 Black and white markings with some brown, medium to large sized duck, broadish beak.